A 5th level web demonstrates reverence for the customer and extends the concept of "customer" to the "attention customers" who pay with the increasingly valuable commodity of their time engaging in web content. Few companies are there. Is yours? Read along to find out. A 1st level web is a problematic website with issues anybody can notice, such as missing images and links that lead nowhere. Likely leadership attitude: "the internet is not important to us." The next step? Get serious and realize that it's probably better to not be on the web than to have your company poorly represented. For many prospects, your website may be the only impression they have of your company and they'll judge you by it. In their minds, if your links don't work, your widgets probably won't either! A 2nd level web may not be so obviously problematic, but an expert will see clear problems. Copy and images will likely be short of the professional standard the company would like to be connected with. There may be problems that create issues with search engine indexing, like missing metatags. Links may send visitors away from the site and off to supplier websites where they will find other, alternate vendors. Etc, etc. Likely leadership attitude: "we have a decent website, that’s good enough." The next step? Raise your standards. If you want to be taken seriously these days, your website needs to show a high standard of professionalism. You may also be missing more leads than you know because of issues a professional will quickly catch. A third level web presents a professional image and is easy to navigate. While it may not match the best competition in the niche (for budgetary reasons or otherwise), it presents the company in a relatively good light and is free of any problems that even a web professional would quickly note. The next step? Again, raise your standards, this time with benchmarking. To understand today's web standards, study the leaders in your niche with the help of a trusted web firm. 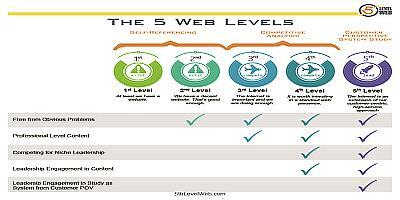 A fourth level web is at the tops of its niche competing for leadership if not the clear leader. Research-based content is updated on a tight schedule, benchmarked against the best competition, and built with the support of the best minds in the company. 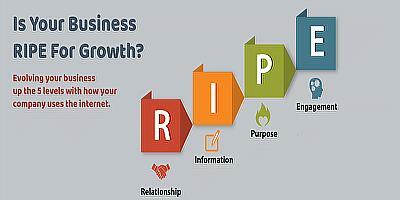 There is likely to be consistent, professional social media, email marketing, and blogging. The next step? 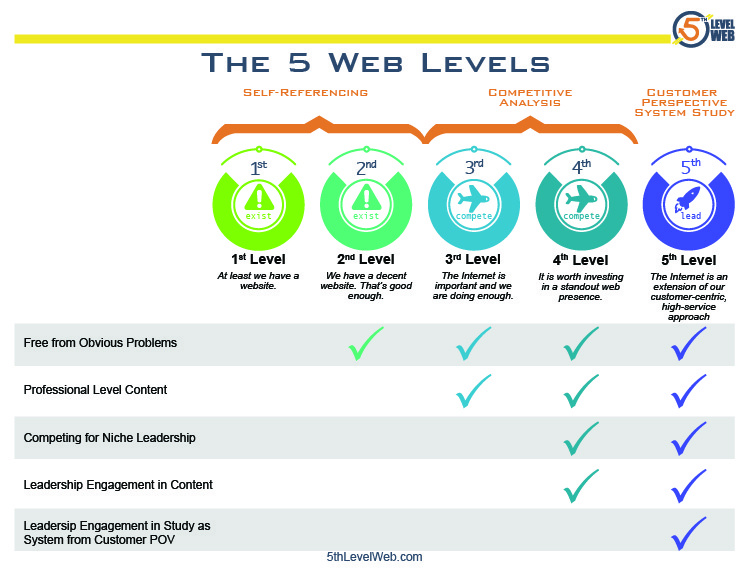 An outside-in, customer service approach to web content.. To move from 4th level to 5th level is to shift paradigms and use web content as an extension of customer service. A 5th level web demonstrates reverence for the customer and extends the concept of "customer" to the "attention customers" who pay with the increasingly valuable commodity of their time engaging in web content. Leadership comes from focusing on the (attention) customer and the competition is still studied, but within the frame of making sure no stone is ever left unturned in finding new ways to engage and serve attention customers and customers. The next step? To maintain this leadership, keep a program of never-ending improvement in place .True, clear leadership comes through study of the customer and how your business responds to customer media demands as a system. "There is no finish line." Want to upgrade your web to a higher level? Click here to contact us for a free consultation. 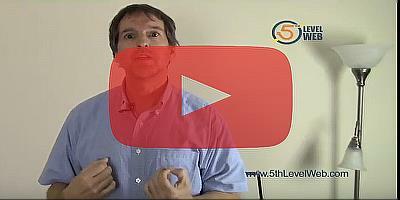 A quick introduction to the 5 levels of the 5th Level Web Model.